We’re Celebrating 6X More Funds for Schools! This week we wrapped one of our favorite jobs at Schoola HQ: we just put thousands of checks in the mail to our partner schools. This fundraising period, schools received 6x the amount of much-needed funding as we were able to give this time last year. That means more field trips, music classes and iPads in our schools. And we have all of our donors and customers to thank for that. Our top-earning school, PS 9 Teunis G. Bergen School, raised a whopping $34,000 in the past three months alone! This means their students get to go on field trips this year. Read more about their #SchoolaSuccess on the PS 9 school page. We’re now a community of more than 558,000 families working to support schools by donating and shopping. We’ve welcomed a few new additions to the Schoola family: you can now donate & shop for baby and maternity clothes, which means more ways to raise money for schools. We can’t wait to see what the next three months will bring. Thank you for everything you do. Share this message to keep up the good work! My least favorite thing about fall is the shortness of daylight, and this weekend we will lose a whole hour of it at once. 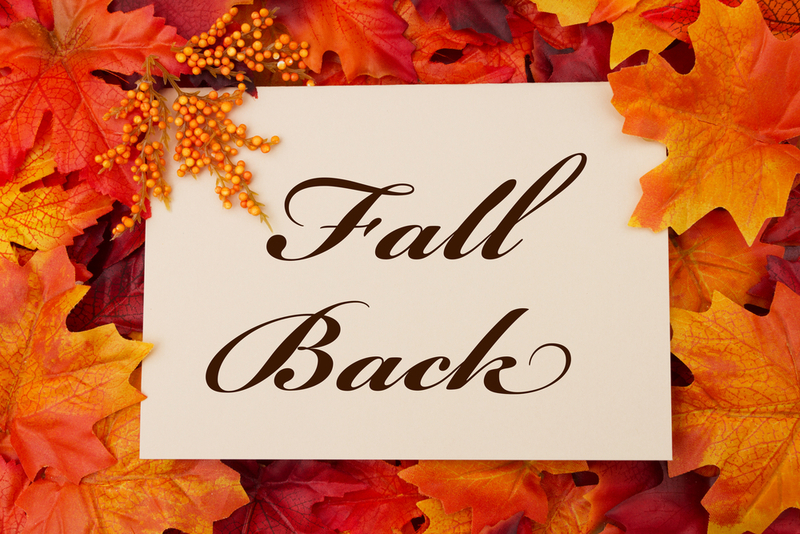 We’ll be officially welcoming fall (and winter) this weekend as Daylight Savings Time comes to a close on Sunday. You’ll need to set your clock back one hour at 2 a.m. Sunday, November 1st. Spend a little extra time together during family game night on Friday in preparation for the time change Sunday night. Starting this evening, it will become a good idea to let your kids stay up a little later than usual to prepare for the big shift on Sunday night. This might mean a little extra time for family game night on Friday and 30 minutes to an hour of extra Halloween fun as well! Slowly transitioning to a later bedtime will be the easy part, as this will probably be seen as a “bonus!” to your little ones. Start practicing for a later wake-up time by sleeping in on Sunday morning! This will be the trickiest part for my almost-two-year-old who is an early riser. I plan to triple-check that the blackout shades in his room are fully operational, and might even reinstall an old set in my kindergartener’s room in order to help her make the transition for the first week or so. Look at the bright side—you will likely have a little extra time in the morning for the first week, as your body will probably wake you up before your alarm. Our family plans to take advantage of this by shifting some of our typical afternoon activities (like walking the dog) to the morning. Getting outside is a great way to help your body adjust to the new time, as daylight is the single most influential trigger to your body’s circadian rhythms. 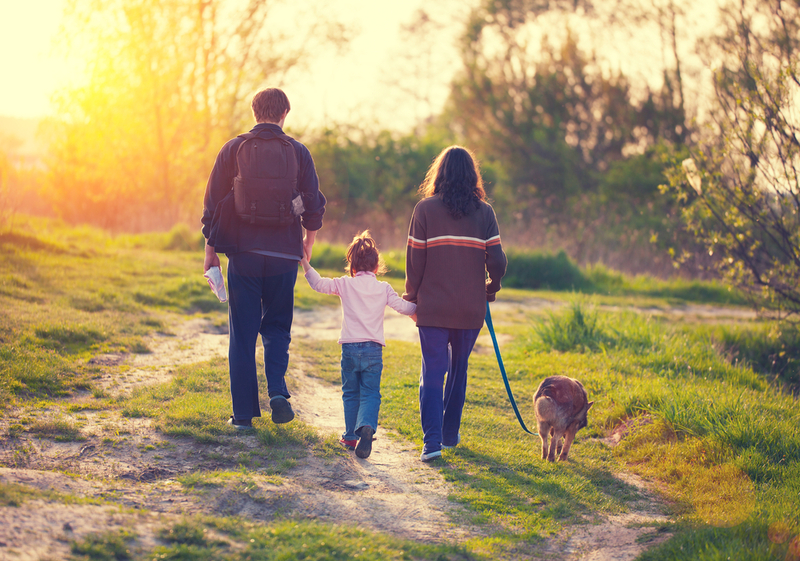 Shift your evening walk with the dog and kiddos to the morning when it will be brighter. When you are stretching bedtimes later, be sure to do so without screens. Television and cell phones stimulate kids and make it harder for them to settle down to sleep on their own. Make it a habit to turn off devices at least an hour before bed to get better quality sleep. Get glowing. A very real side effect to neighborhoods getting darker earlier is increased danger in transportation. Make sure your kids have the appropriate reflective gear for walking or biking in the dark. Megan’s favorite school memory is discovering a Peer Counseling program that helped her become a leader in her toughest year of grade-school–when she grew 11 inches in 12 months, and changed schools as a 5’8” fifth-grader. 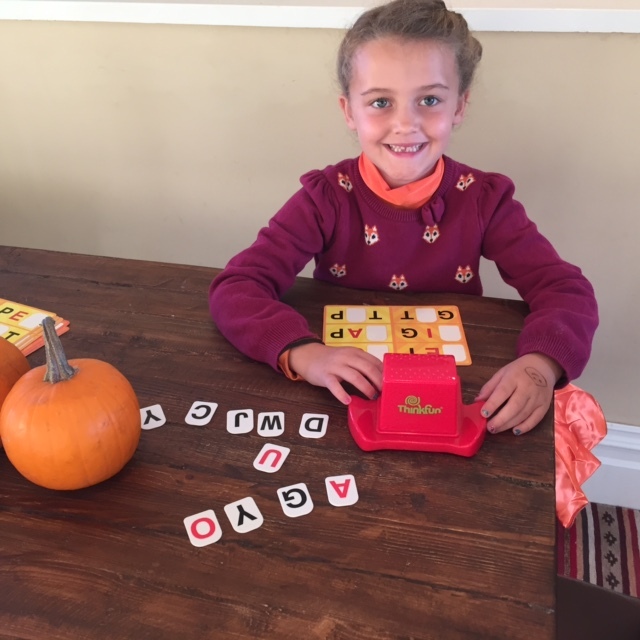 Now she is a mom of two bay area babes, and spends the workweek helping more parents find and leverage Schoola to fund their school programs. When it comes to creative ideas for how to fundraise for my daughter’s school, doing a Schoola clothing drive was a no-brainer. It was super accessible for everyone in our community, and gave a everyone a chance to contribute and get involved! Leverage Schoola fundraising coaches as a resource: I worked with Tim to set the date for our drive, get custom flyers, and schedule a pickup for our donations. He was able to give recommendations for the duration (one week) and set expectations. Make the ask easy. Our elementary school has aggressive fundraising goals, which is awesome, except sometimes it feels like they are always asking for money. So, hosting a fundraiser where we are asking families to clean out their closets instead of their bank accounts was an easy ask. I mean who doesn’t have to clean out their closet from time to time, especially with kiddos who sometimes outgrow clothes even before they are worn? It was an easy way for our whole community to contribute and get involved! Timing is everything! A large portion of community of parents “drop and go” in the morning, so they don’t always have the opportunity to see our message board and signs around campus. We timed the clothing drive to be a week after back-to-school night. Hosting the drive the week after back-to-school night worked out perfectly because parents had the opportunity to learn about the drive while they were on campus, seeing exactly where they would need to drop off their donations. Get the kids involved. 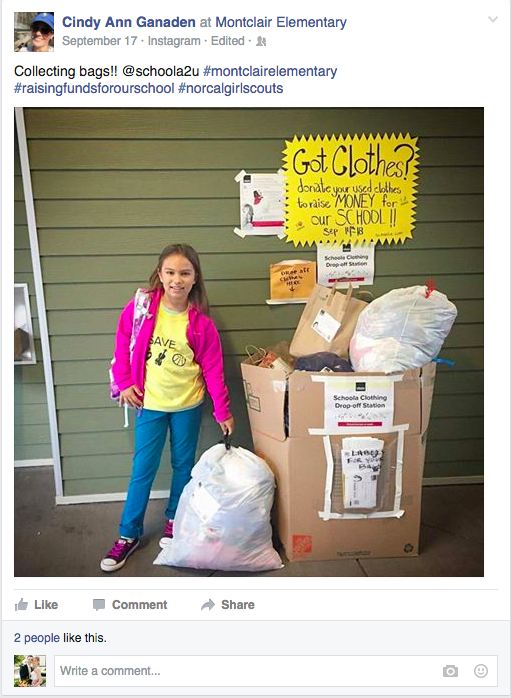 My daughter’s local 4th Grade Girl Scout Troop volunteered to be Clothing Drive Ambassadors. 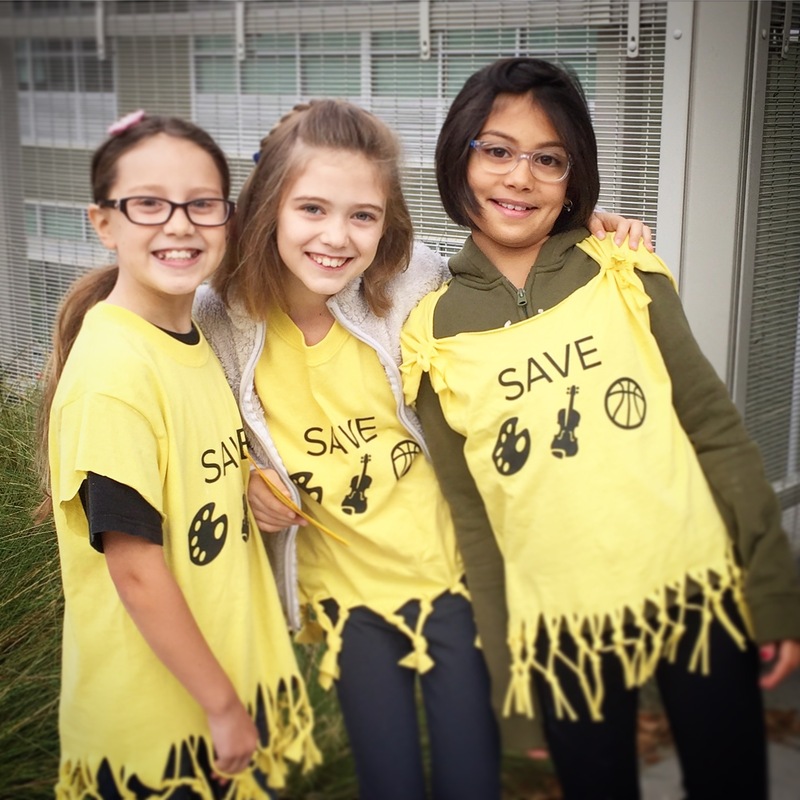 They each wore personalized t-shirts, which made them feel important and we made it fun by asking the girls to make signs and pass out flyers and stickers in the front of the school during our car line drop-off the week of the clothing drive. The girls even decided to collect the bags from parents so they didn’t even have to leave their cars. Get the word out. Not only is it important to get the word out, but to get it out in lots of different ways! We comminuted through emails, flyers, posters and word of mouth. 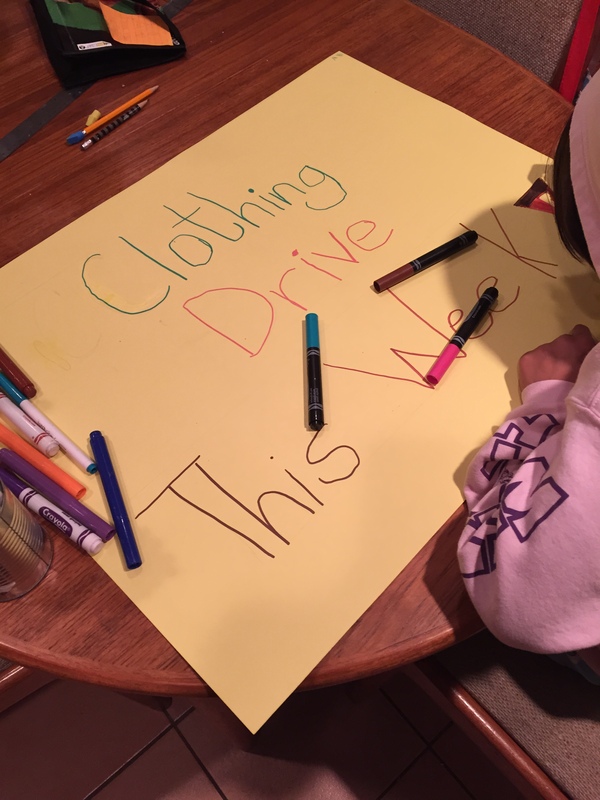 Email-newsletter & paper-flyers: We included info about the upcoming clothing drive in our weekly newsletter 3 weeks before the drive and added it to our school calendar as well as sending home a flyer with every student a week before the drive. Then during the week of the drive all kids went home with another reminder flyer and sticker to place on their donation bags. Posters: This took a little more time but it was an extremely effective way to let folks know about our drive. Our Local Girl Scout Troop made big and colorful posters to hang up all around the school and we made sure they were in all the prominent places where we get foot traffic so parents would see them. Word of mouth and social media: Our Girl Scout Troop was super excited to be doing community service for our school and were amazing advocates. They made sure to ask their friends to clean out their closets to help our school. And we got parents talking about it as they waited in the yard during pick-up and posted about it on our school’s Facebook page. In the end with all our efforts our school collected a whopping 225 bags of clothes. This was an amazing and easy fundraiser for our school. You can check out our school page and track our progress here. And what are you waiting for? 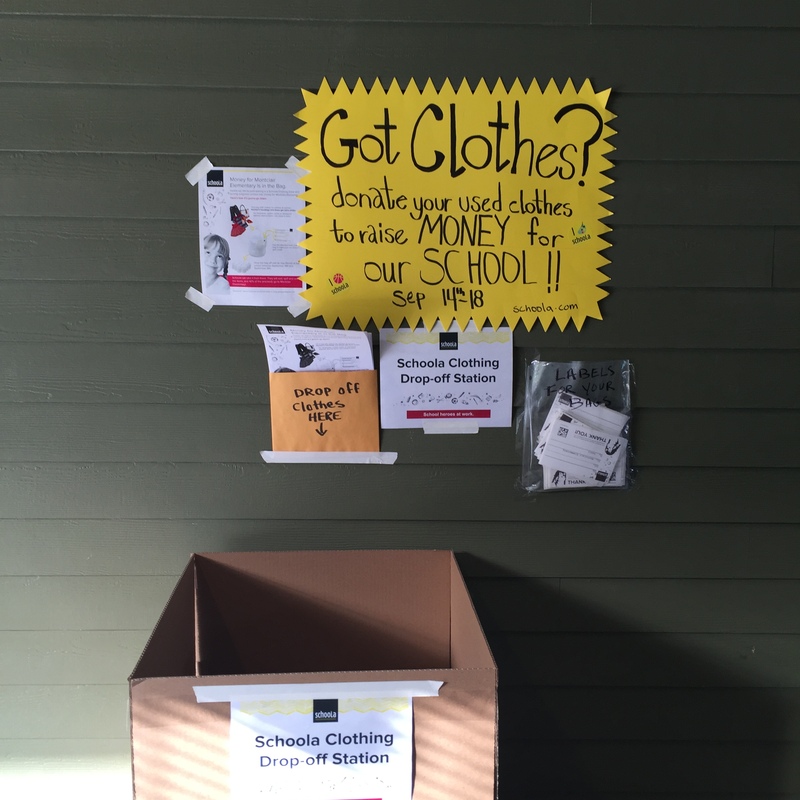 Sign up for a Schoola clothing drive today! Cindy Ann’s favorite part of school was always art class, from drawing and painting to collaging and gluing (and at times tasting the paste). After winning 1st place in her 3rd grade Art Show there wasn’t a creative art class that she didn’t sign up to take. Now as a mama to Ava Blu, and author of a mother & daughter craft book she knows how important it is to have Art offered in schools. It’s not just about making pretty pictures it’s about getting kids thinking and developing them into creative learners with the ability to seek questions, create their own ideas and make personal connections. Introducing our “Brands Give Back Flash Sales” Benefitting the Malala Fund! We’re partnering with brands including Gymboree, Tea Collection and ModCloth to raise money for the Malala Fund. These companies have made generous donations of thousands of new-with-tags items that we’ll bring to you each week! You can feel great about shopping these exclusive collections because every purchase supports the Malala Fund. Each week in October we will launch a new sale. Schoola donors get first pick of each sale on Mondays. On Tuesday, our whole community is invited to shop the sale. You get incredible values on new-with-tags items, up to 80% off regular retail prices! And every purchase supports educational projects in the most vulnerable communities in the world. Our first brand to give back with a generous donation to the Malala Fund was Gymboree. 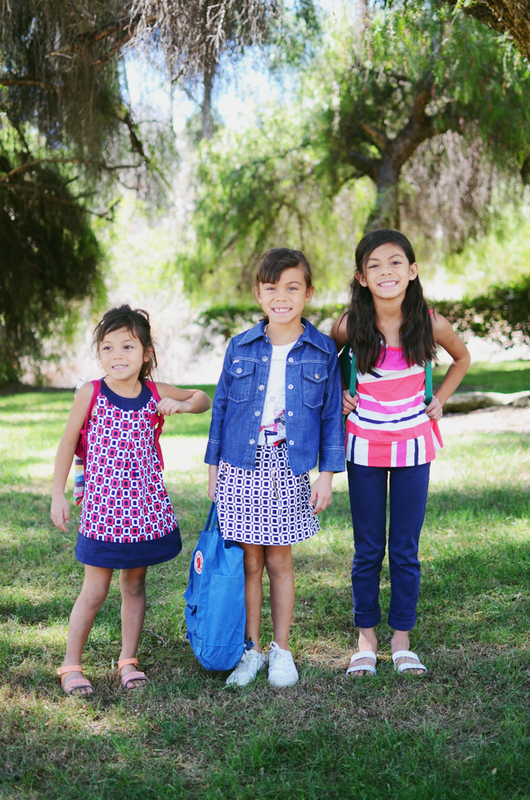 Shop the coordinating collection of adorable playwear in kids’ sizes 4-12, right here. 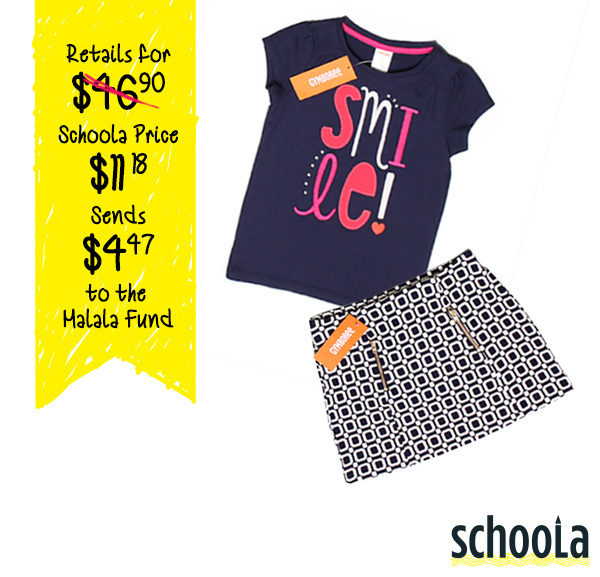 You can put together an adorable outfit for under $17 and $6.70 goes directly to the Malala Fund. Come back each week—we’ll be launching new-with-tags flash sales from Tea Collection, ModCloth and more soon! It’s just one more way we can partner together to help kids reach their potential. When Malala Yousafzai was just 14 years old she was shot by Pakistani militants who were angered because she was standing up for equal rights and education for girls. Malala survived this assassination attempt and went on to be the youngest recipient of the Nobel Prize at age 17. Malala is making a huge impact by advocating for increased access to education for all children in the most vulnerable communities in the world. Schoola is standing #withMalala to support this important mission. Not only are we sending 5,000 students to see He Named Me Malala in partnership with the Students Stand #withMalala program, we also wanted to make it easy for anyone to join us in sharing this story of hope. Step 1: Go online to Schoola and request a donation bag. 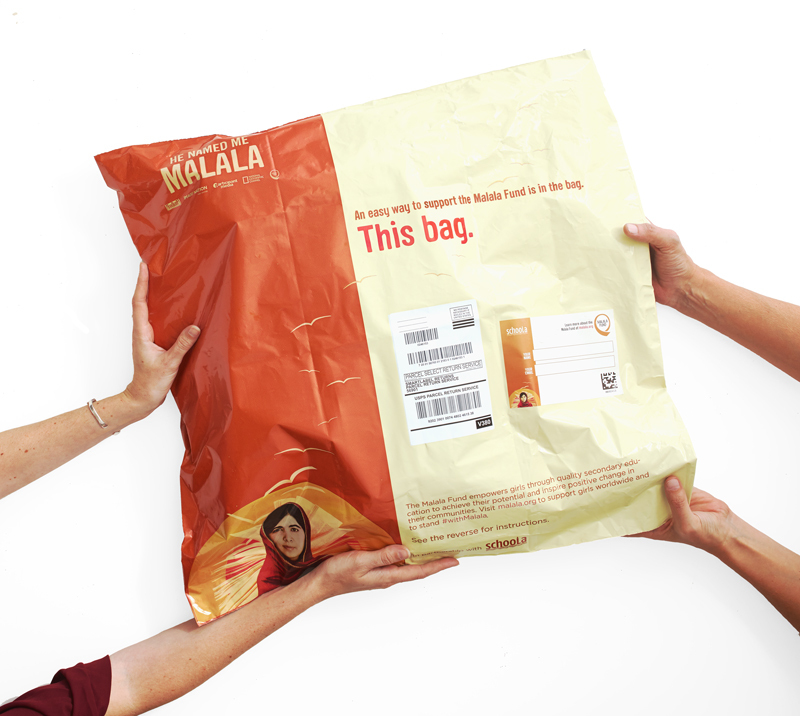 Step 2: Once you receive the bag in the mail, fill it and return it to benefit the Malala Fund. Schoola is now accepting baby clothes as well as women’s and kids’ clothing, so use this as an opportunity to clean out your closet and start the new season off fresh! And if you have pictures to share of your family filling a donation bag, we’d love to see them so be sure to include them in your social media update! Step 4: Pat yourself on the back! Not only did you request a bag to turn unused items into educational opportunities for girls, but by challenging others you also helped spread this incredible message of hope and opportunity. Please share with everyone you know! Join us in creating momentum around this #PassTheBag challenge.